Sometimes things do not work out the way you plan. We had planned to go to a Corps of Engineer Park after Clear Lake State Park. But when we arrived and went into the park, it was closed. Evidently too little water. But no notice online or on the way into the park--very unusual. 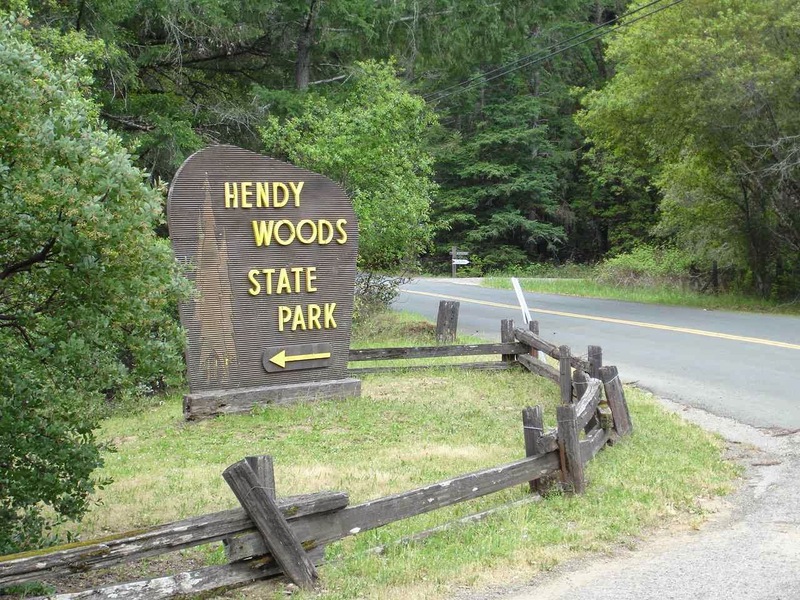 So, we saw good reviews for Hendy Woods State park, called the office, and away we went. No easy way from Route 101, but we were guided over Route 253--a gray road. A gray road with some of the sharpest corners and steepest hills we had yet seen. Phew!!! But, what a gorgeous park! A nice big, private site. 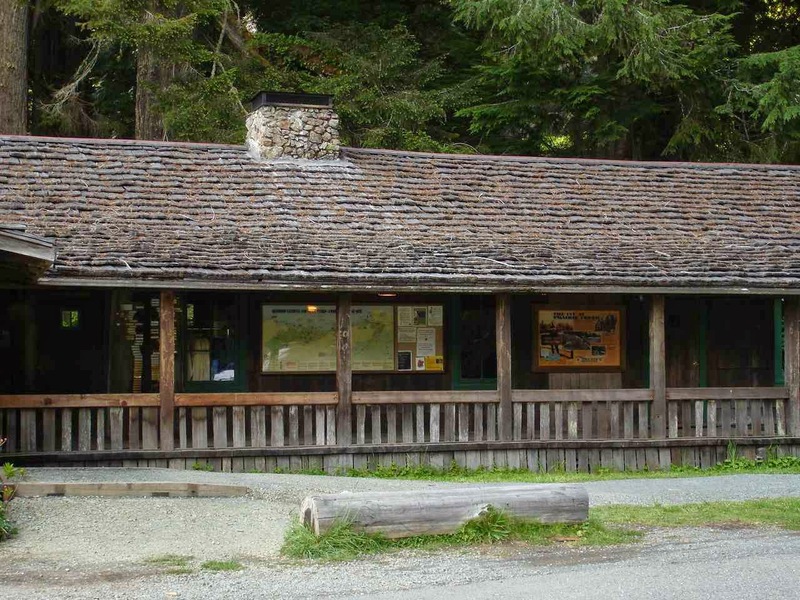 And, what we had not realized, it was an old redwood forest state park. 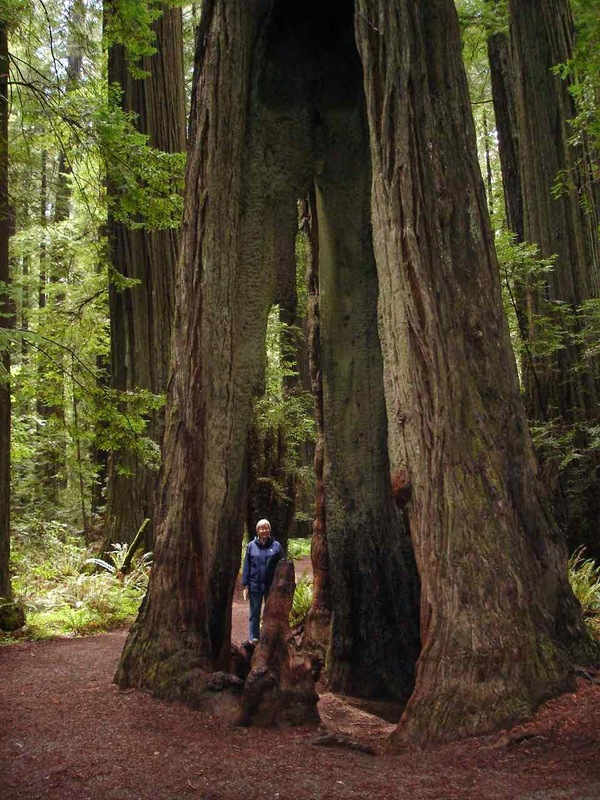 Huge redwoods. 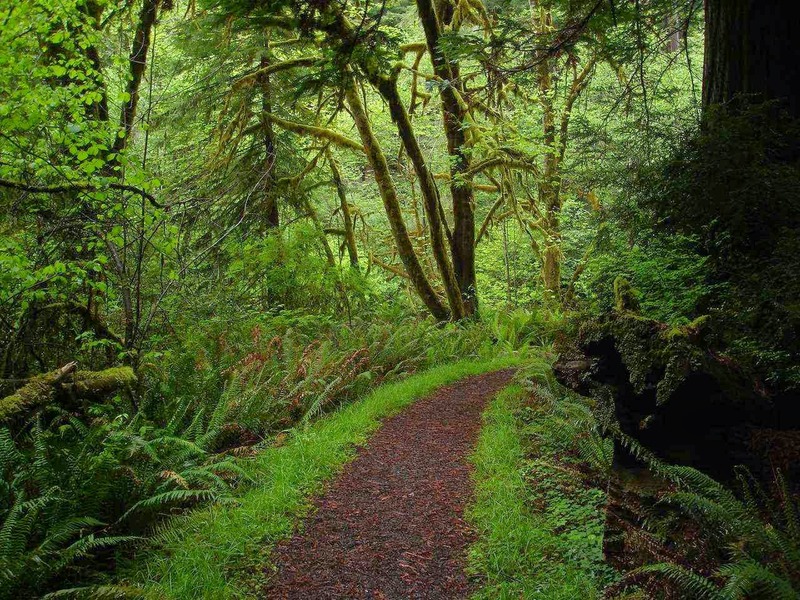 Some great hikes in the park all around the giant redwoods. Also down to a small stream. While the sequoias grow mostly at elevations of 5,000 to 7,000 feet, the redwoods grow in a narrow band just away from the ocean from northern California into Southern Oregon. 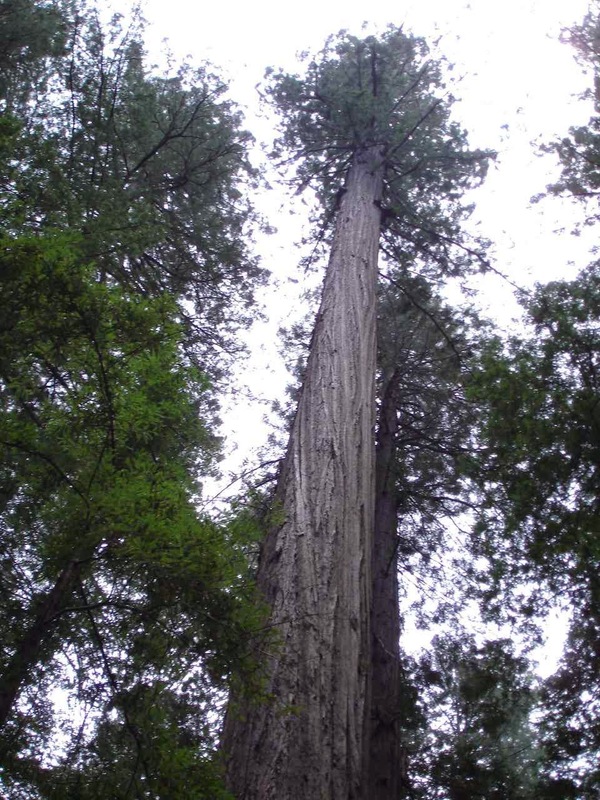 While the sequoias are the largest living things on earth, the redwoods are the tallest trees in the world. Either way, they are big trees. 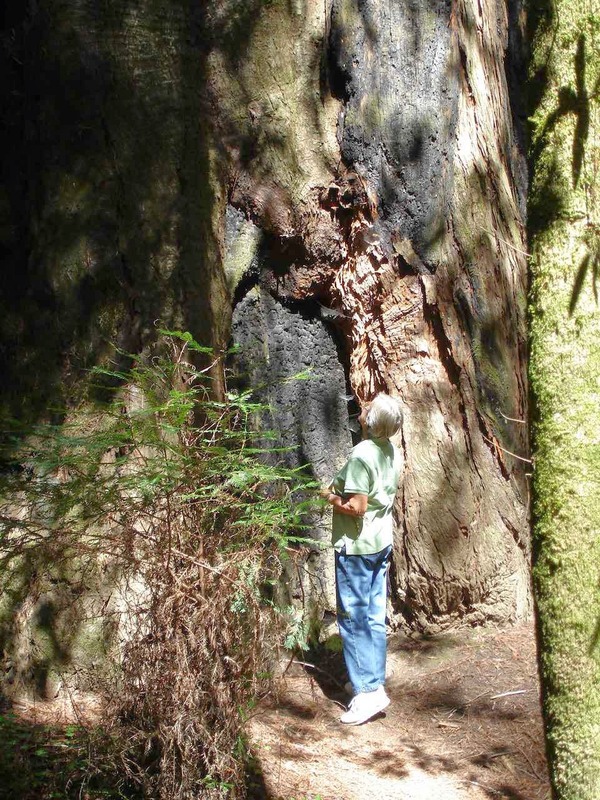 Since both sequoias and redwoods can live thousands of years, you see a number of each that have huge fire scars. The trees have an ability to withstand forest fires. Even with huge scars, the trees stay green and alive. To help with protection, they have bark that is up to one foot thick. 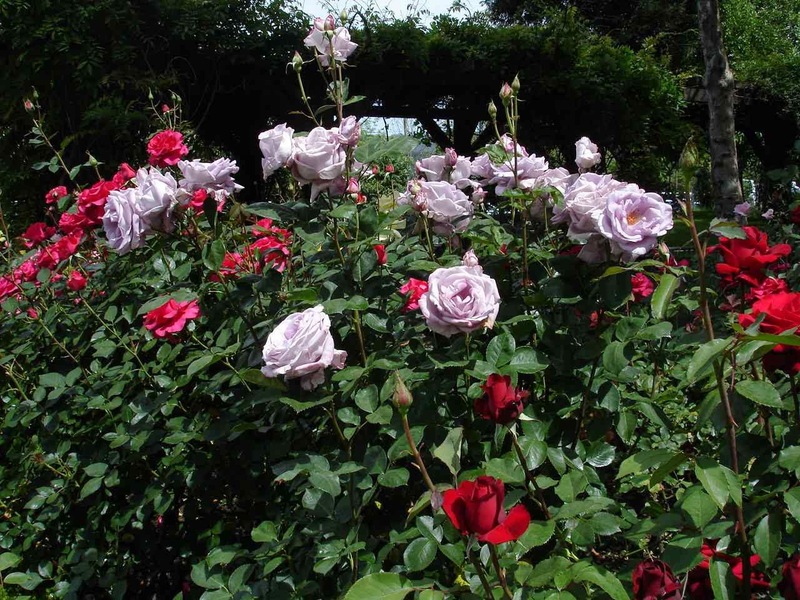 It is also resistant to disease and insects. 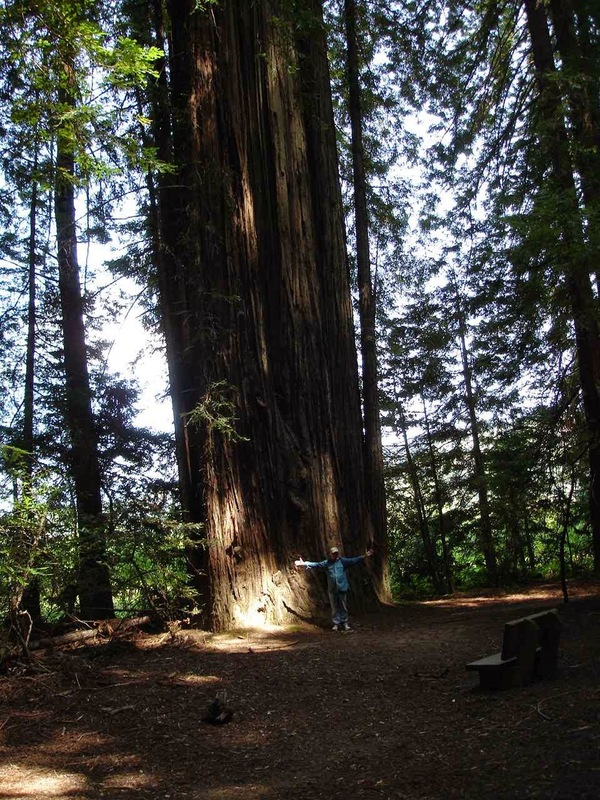 Most sequoias and redwoods die from toppling over. 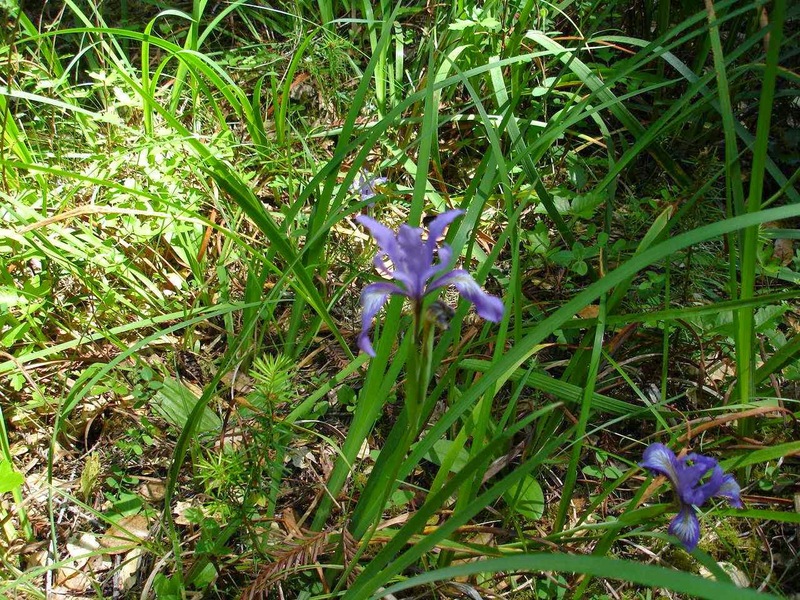 The park had some nice examples of wild irises in bloom. 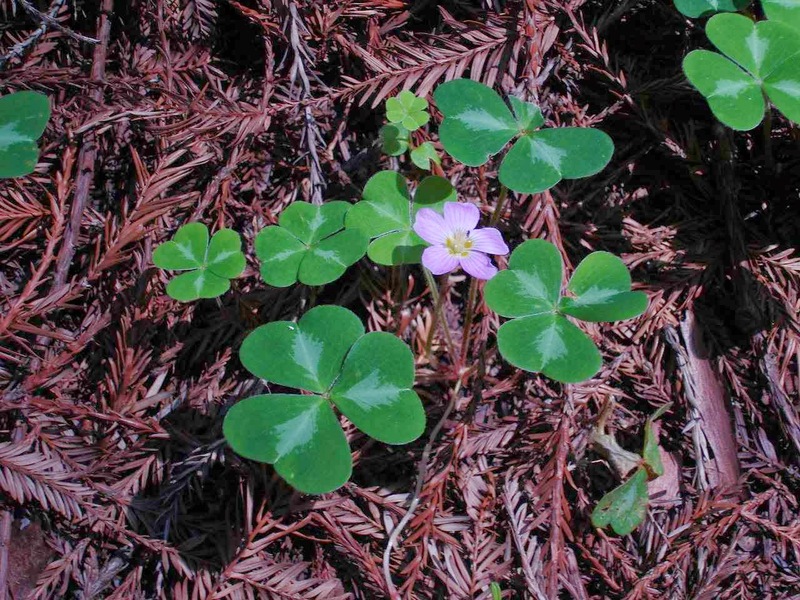 Also what looks like a three leaf clover , is called Redwood Sorrel. The forest floor is covered with these. Also, a lot of poison oak. Watch out! 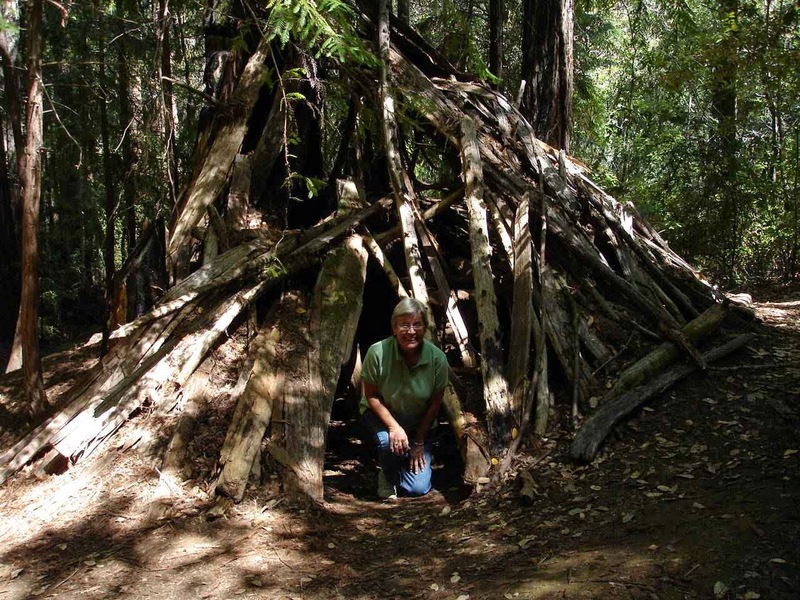 In the 1950's to 1960's , there was a real hermit living in the Hendy Woods. He was Russian and had jumped ship shortly after World War II. This is one of his shelters. Though he was very reclusive, he did greet some few campers now and then. After Hendy Woods, we took a longer route around to Route 101 north to the Redwood State and National Park. 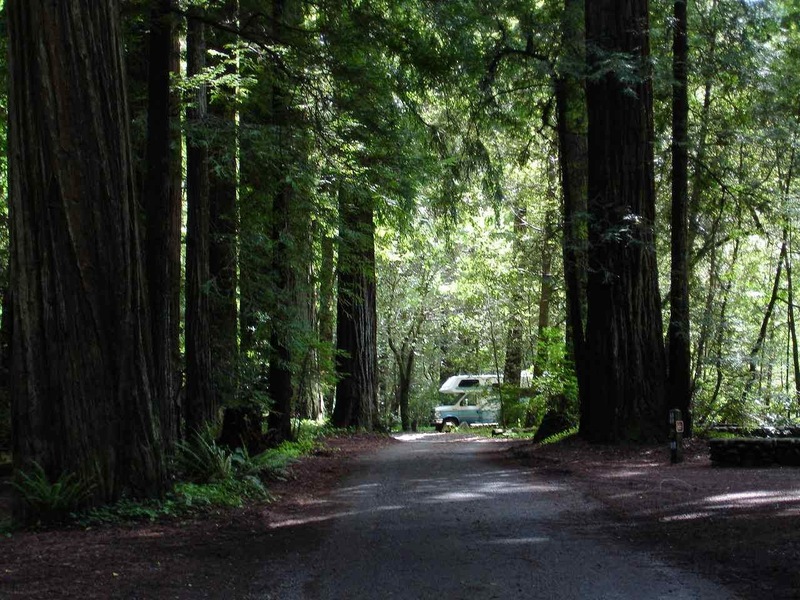 A nice road off Route 101 which brings you to the campground is The Avenue of the Giants. 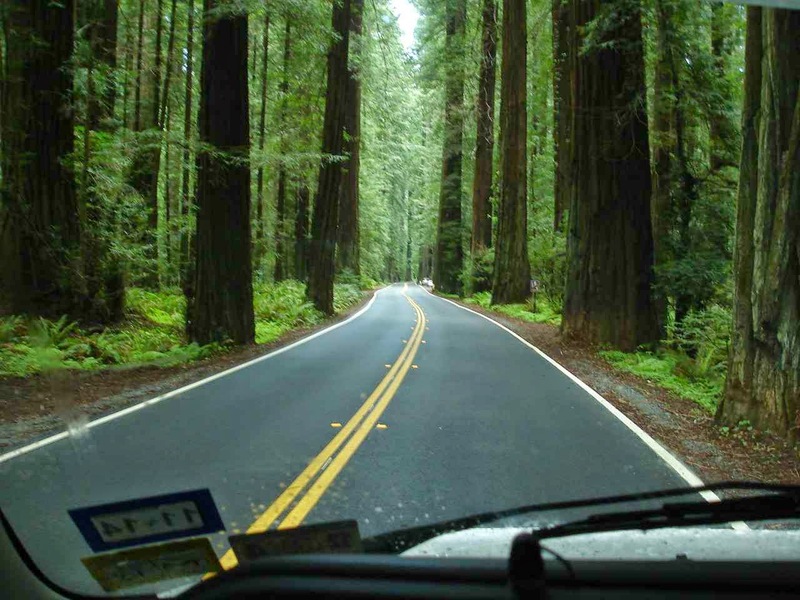 Definitely not recommended for large rigs, it is a very scenic road that winds through grove after grove of Giant Redwoods. 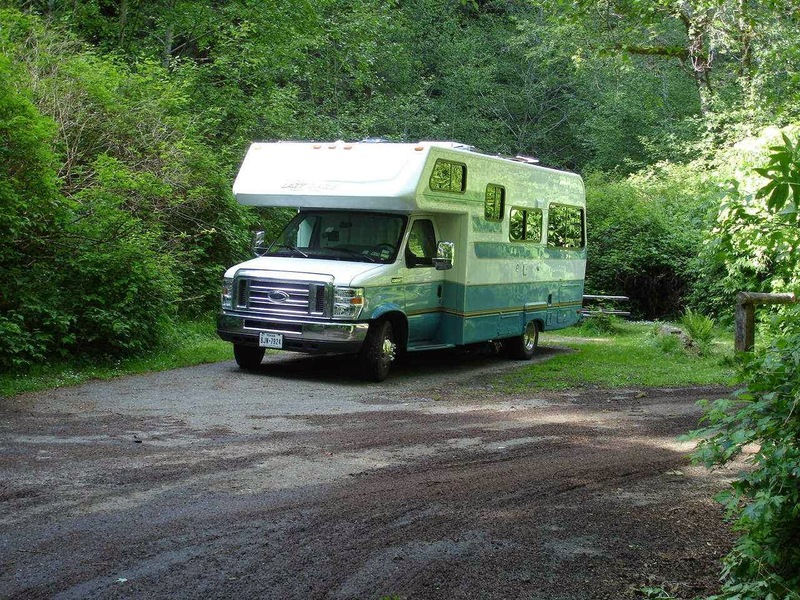 Jan and I stayed at Burlington Campground in the Humboldt Redwoods State Park right on the Avenue of the Giants. It is right next to the Visitors Center. 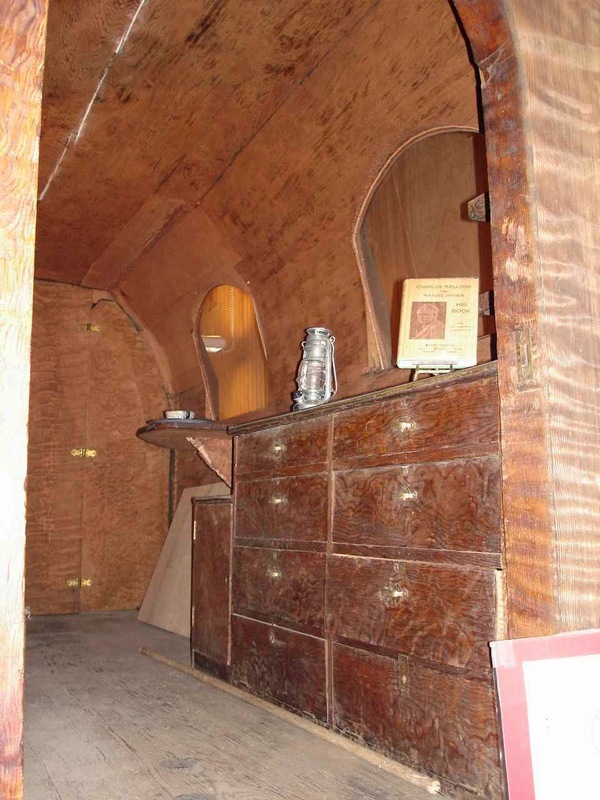 Inside was a museum and this Redwood Travelog. 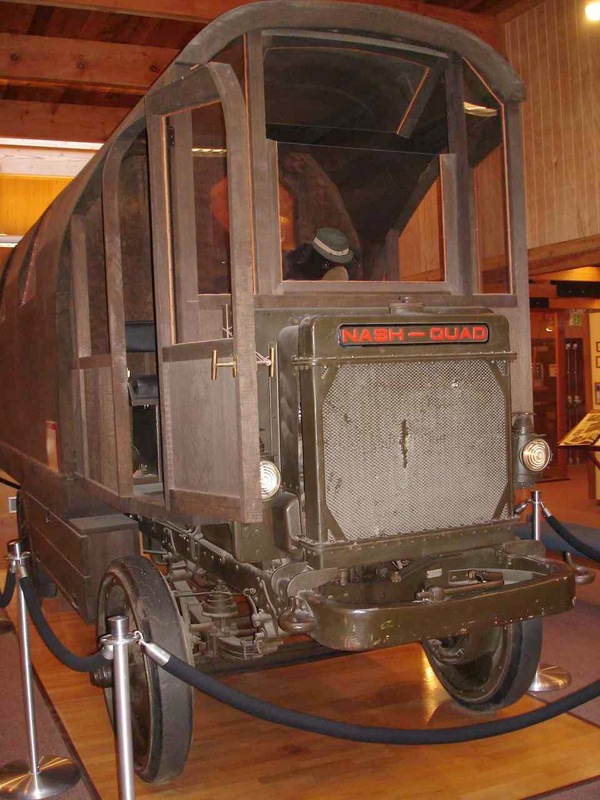 It is an RV built by Charles Kellogg(not the cereal family) on a 1917 Nash Quad truck body from World War One. 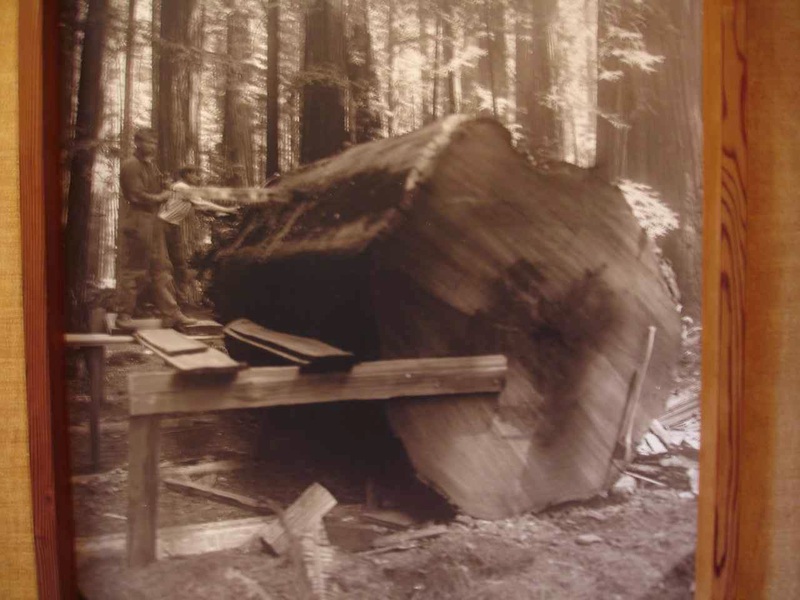 The Redwood log was donated by a lumber company. It was a 22 foot section from an 11 foot diamater tree. This is a picture of Kellogg beginning to carve the RV from the huge tree section. Actually quite comfortable inside. Even had a room for a guest. 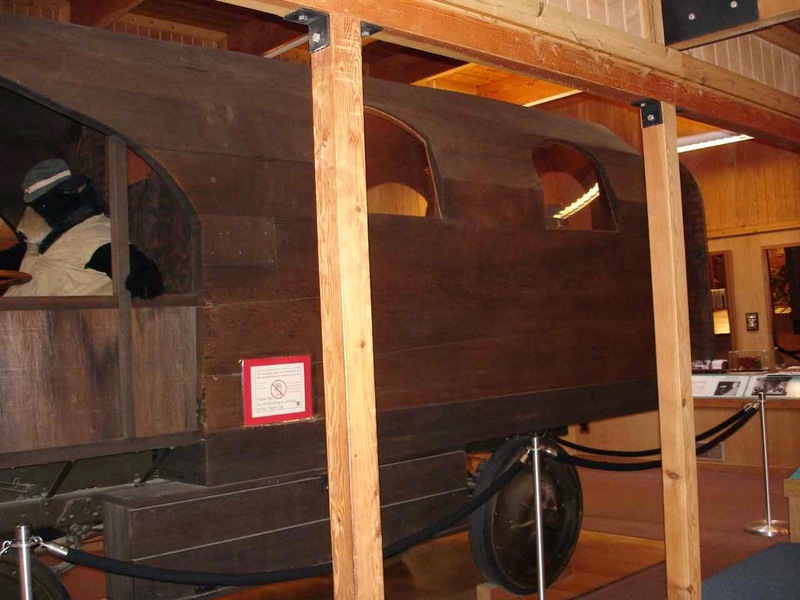 Kellogg drove this unit across the country twice as part of an effort to preserve the giant Redwoods. And yes, it even had windows. The following website gives some more information for this remarkable man who was probably most famous on the Vaudeville circuit and on record as a bird singer. Scroll down on that website for pictures of Kellogg with his Travelog. 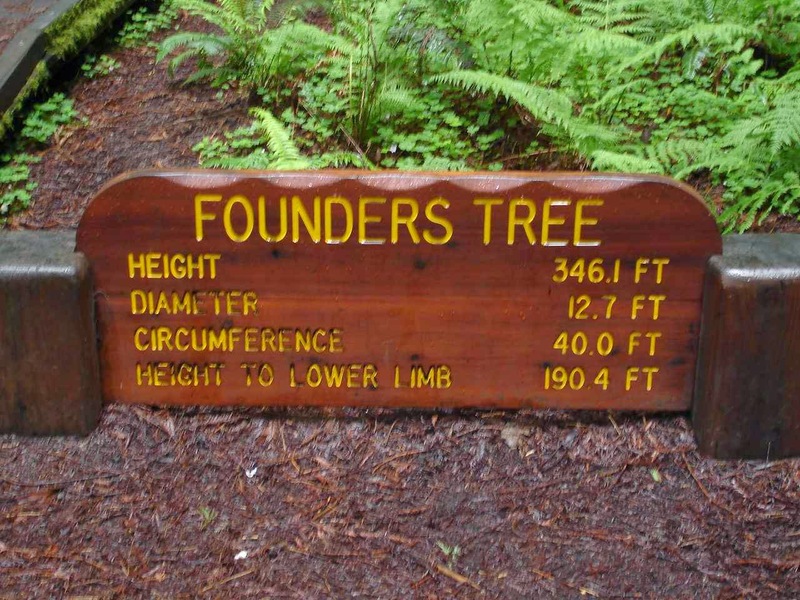 Along the Avenue of the Giants is the Founders Grove and this Founders Tree. Note the dimensions. Taller than the length of a football field. Very difficult to take pictures of the whole tree. The groves are like rainforests. Hollowed out from a fire many years ago, this tree is still very much alive. 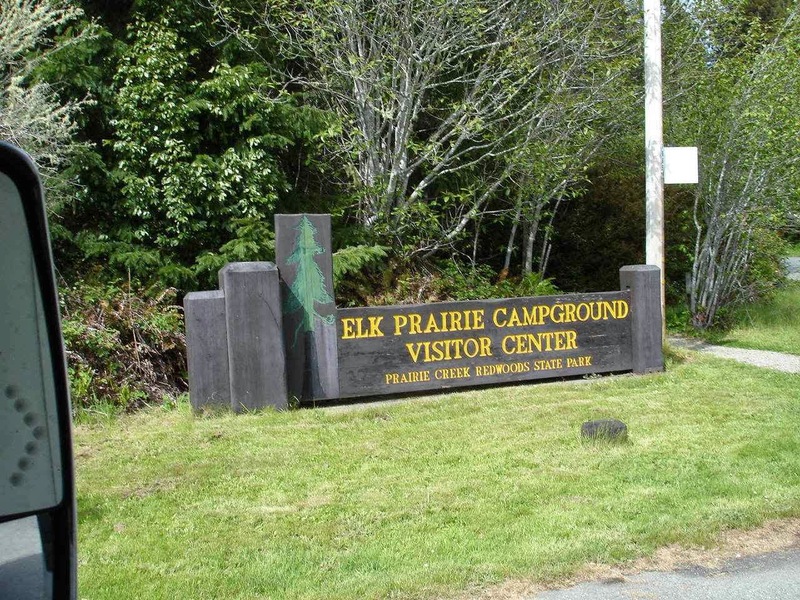 Our next stop along the redwoods trail is Elk Prairie Campground. This is quite close to the ocean. 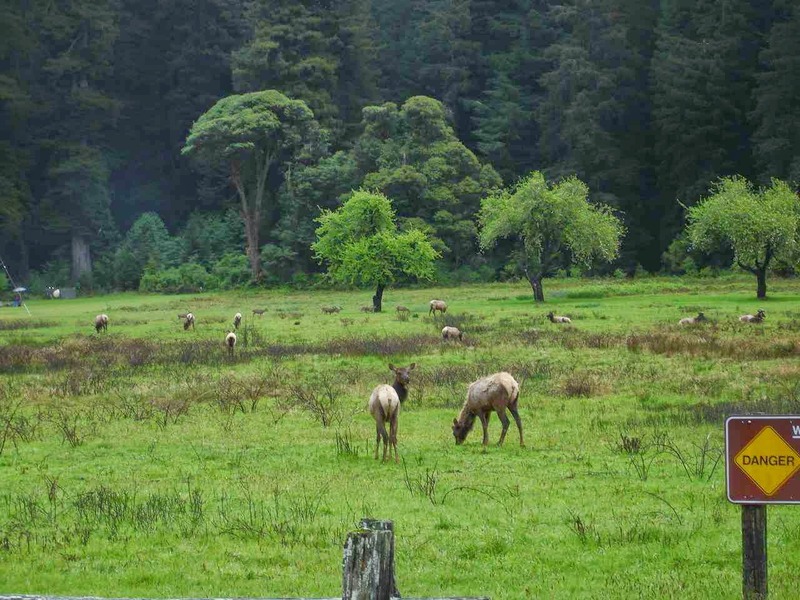 And yes, there were elk right in the campground on the open fields. 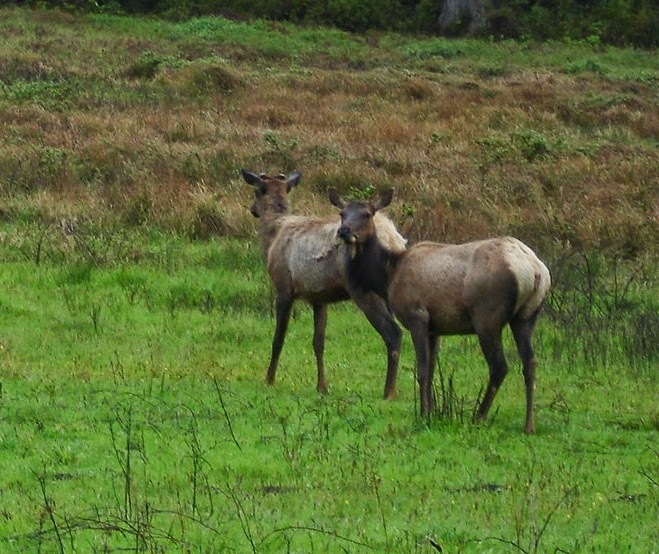 The male elk had mostly lost their antlers, and as you can see from the one on the left, they are now starting to grow new antlers. Their coats are a little rough because of shedding. Remember, you can click on a picture to enlarge. There were about 20 or so in the herd. They freely roam and cross the highway. Our campsite backed up to a great little stream. A big difference in Northern California was 4 straight days and more of rain. No drought here. Once again, we see an example of the Civilian Conservation Corps. 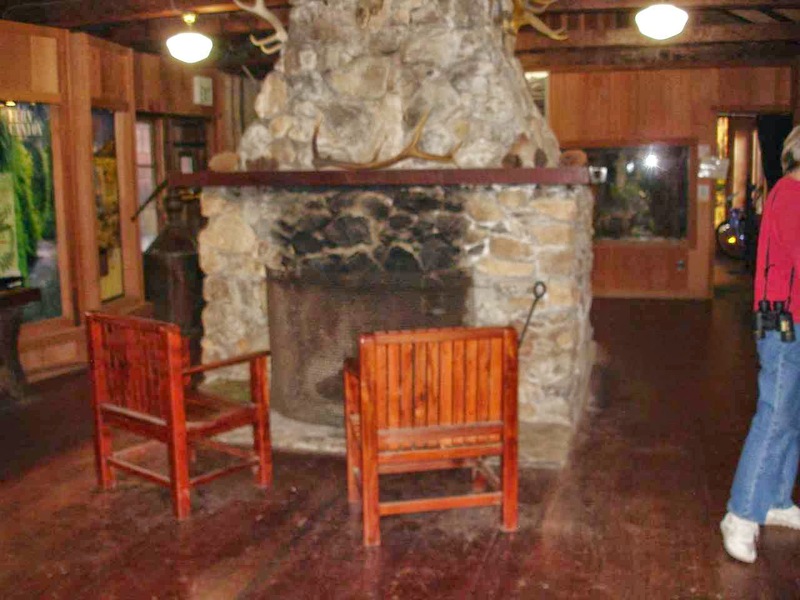 This is the visitors center at Elk Prairie. Gary and Dave---thought of you when I saw the wooden shingles on the roof. The park worker who redid the roof was just there and noticed me taking the picture. I mentioned the wooden , thick roof shingles. He said that he had made them last year. They are all redwood and were hand made with some basic wood tools. He was right to be proud of his work. 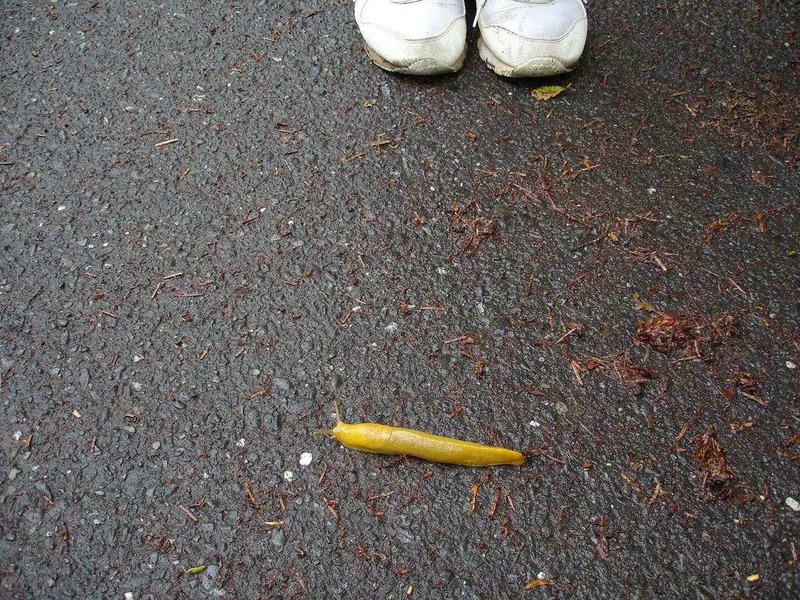 An important part of the redwood forest are the smaller creatures like this banana slug. It helps move the seeds and dirt around. 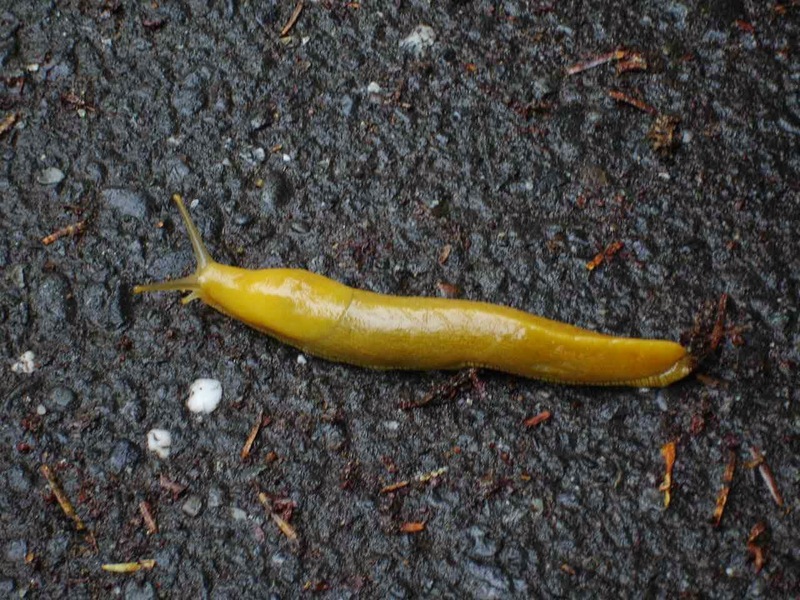 They are between 6 to 10 inches long and very slow moving. Yes, it had rained. But even so, we were still impressed by super green walks through the campground and park. 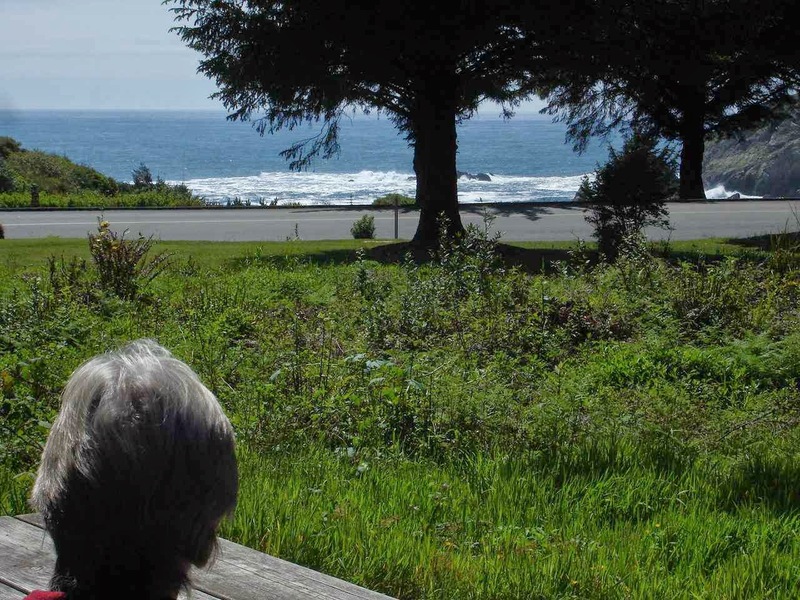 And as if things couldn't get any better, we happened to look at Jedediah Smith State Park, north of Crescent City and on Route 199 along the Smith River. This is our wonderful site and that is the beautiful and wide Smith River behind our site. Lady Blue is happy. 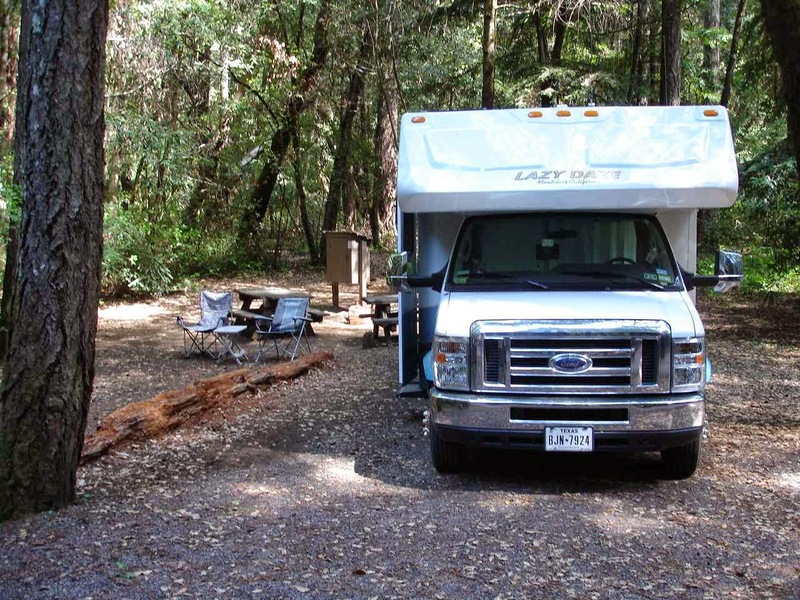 This campground is still part of the National and State Redwood parks, so we are here at half price or $17 per night. Still amongst the redwoods. Lady Blue looks rather small in the giants. What a beautiful park including a day use area and trails. 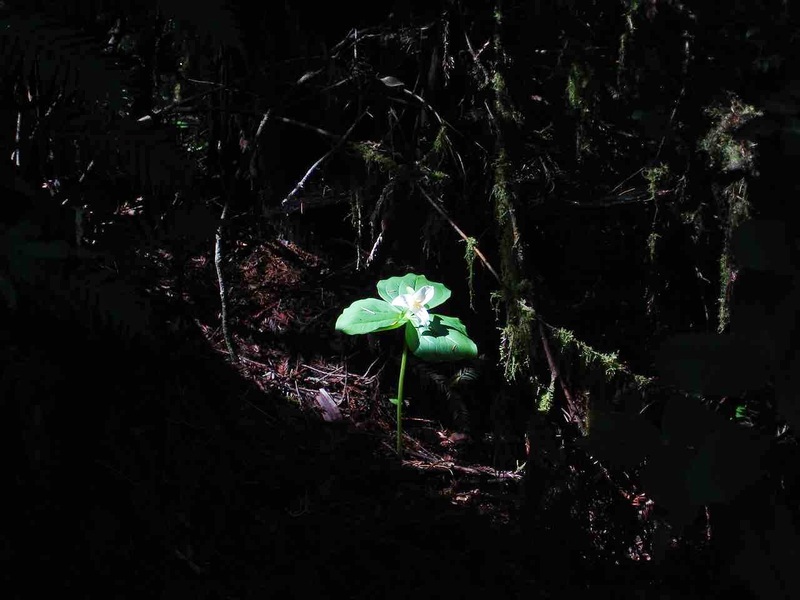 And in the middle of the Redwoods , you can catch a shaft of sunlight with a blossoming Trillium flower. 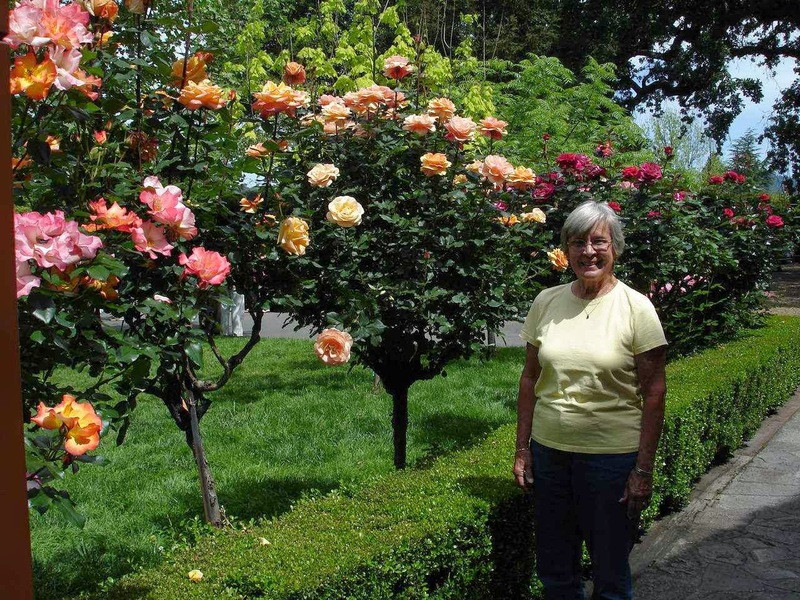 Jan loved our back yard. The river was fast moving and green. But when you looked, even the deep sections were crystal clear to the bottom. Clean water, but the color was from minerals? We would be sad to be leaving California. 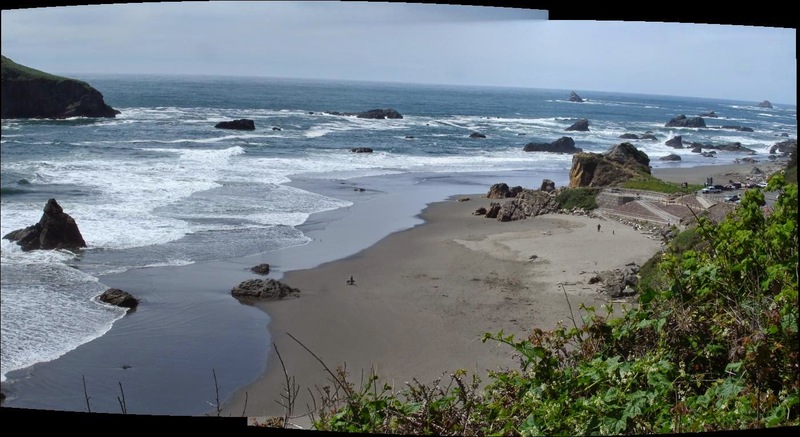 But-----our first stop in Oregon is this beautiful Harris Beach State Park. Note the cars and people down to the right will give you an idea of the size of the rocks and surf. And this is our campsite. Jan and I think we will like Oregon. Such a nice visit to the Corps park at New Hogan Lake and then off to Lodi, California, known as the Zinfandel Capital of the World. What a nice visit. On the website is a picture of the family. We spent a good bit of time talking with Linda and son Shaun. 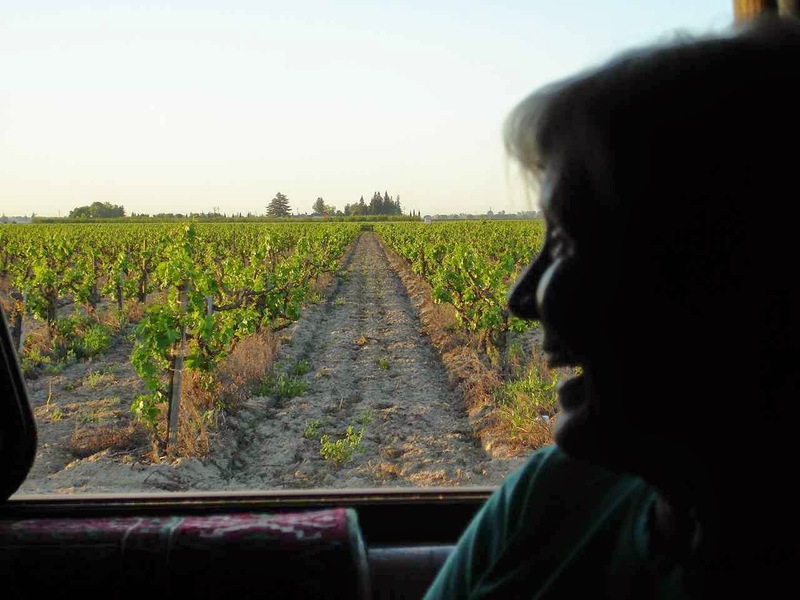 A lot of interesting information about the vineyard and about wine culture in Lodi. Shaun mentioned studies in winemaking at University of California, Davis. 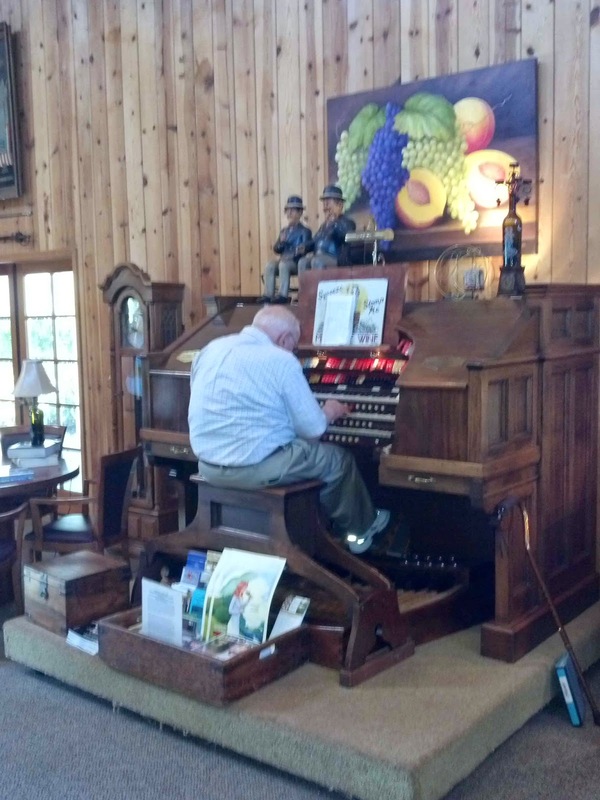 And then, what a pleasure to have Dad come out and play the magnificent theater organ that he installed in the Tasting Room. The organ includes hundreds of pipes and special built enclosures. A sound fit for a large theater. The view out our side window at our camping spot for the night. 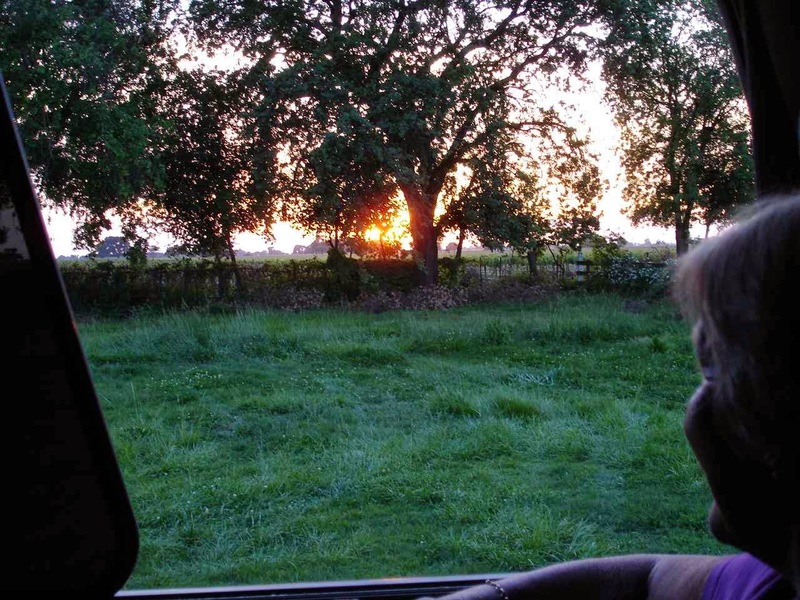 This camping is free, but , of course, the expectation from Harvest Hosts is that you will patronize the farm you are visiting. 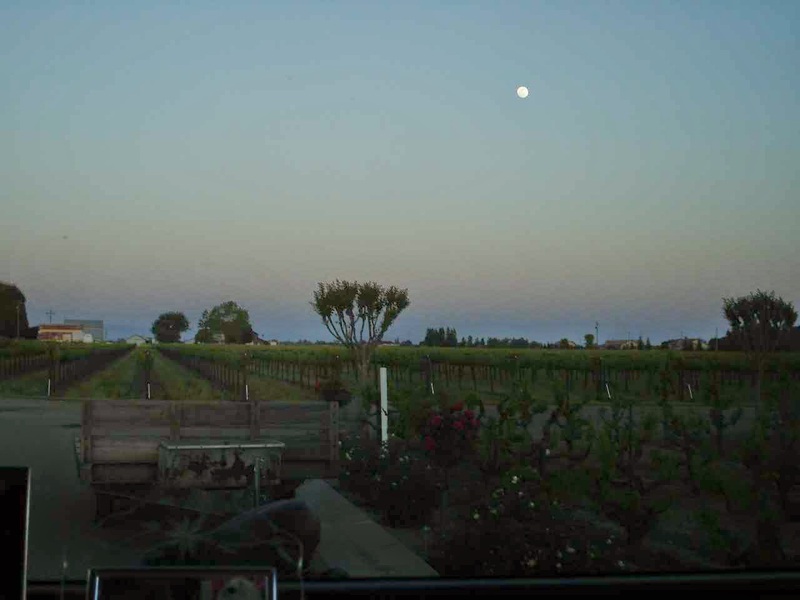 From our back window, more vines, and a great view of the almost full moon. Lodi is not as big as Napa, a little over 62,000 population. Partially for that reason and being newer to the winery scene, there are a number of vineyards that participate in Harvest Hosts. There are none in Napa. 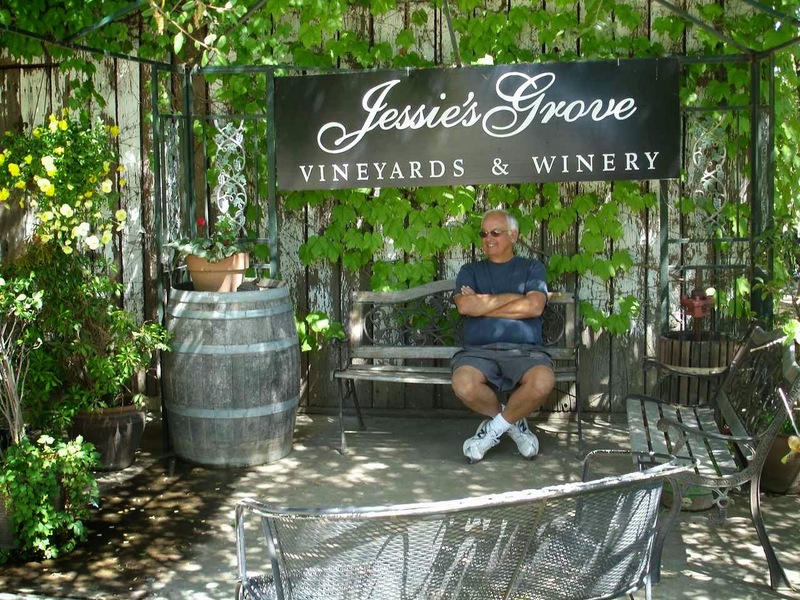 Our next night we go across town to Jessies Grove. Again, a very pleasant visit with much information and great wine. 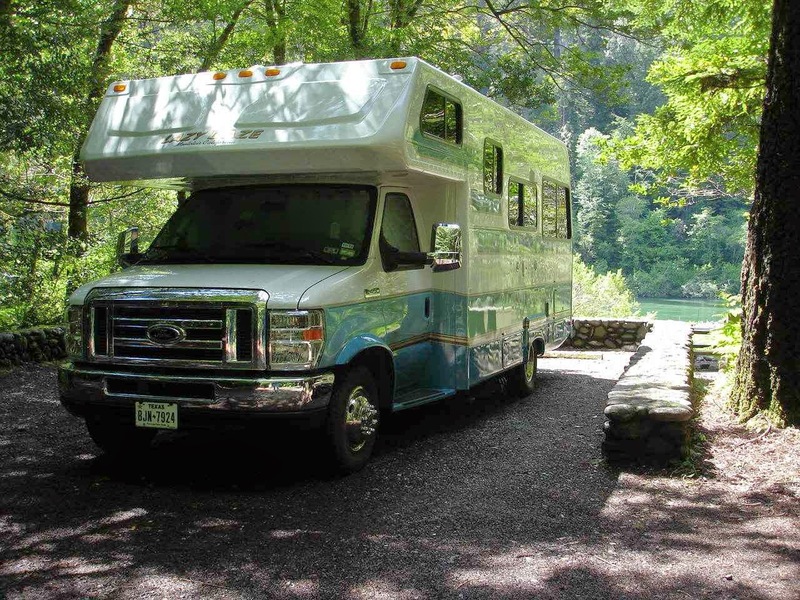 We also meet and talk with some other Rvers to exchange information. Also we show off Lady Blue to a prospective new owner of a Lazy Daze. This vineyard is a lot bigger than Harmony and therefore a lot busier with much farm equipment. Jan and I note that many of the managers and workers are quite young, in their 30's. 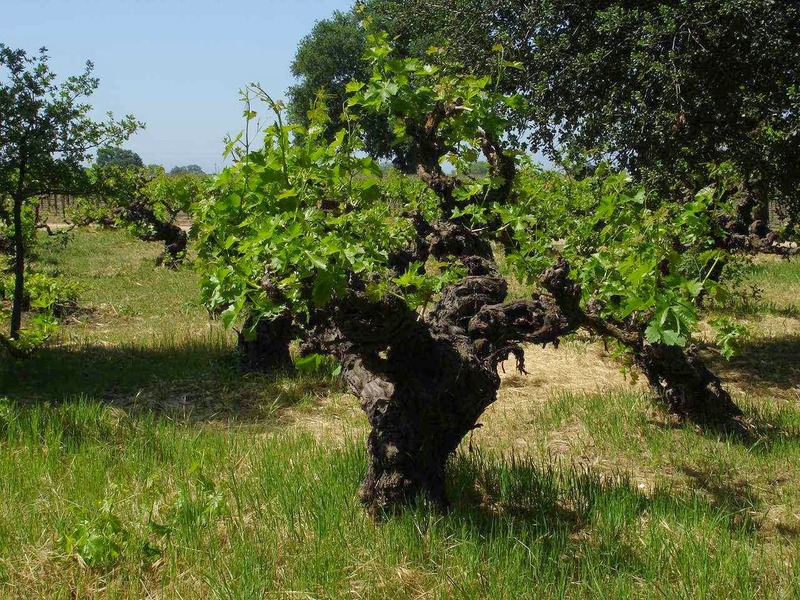 Behind the old house, is the stand of original Zinfandel vines from the 1800's. Looks like a small tree. The original house from the 1800's. Not that old by New England standards. 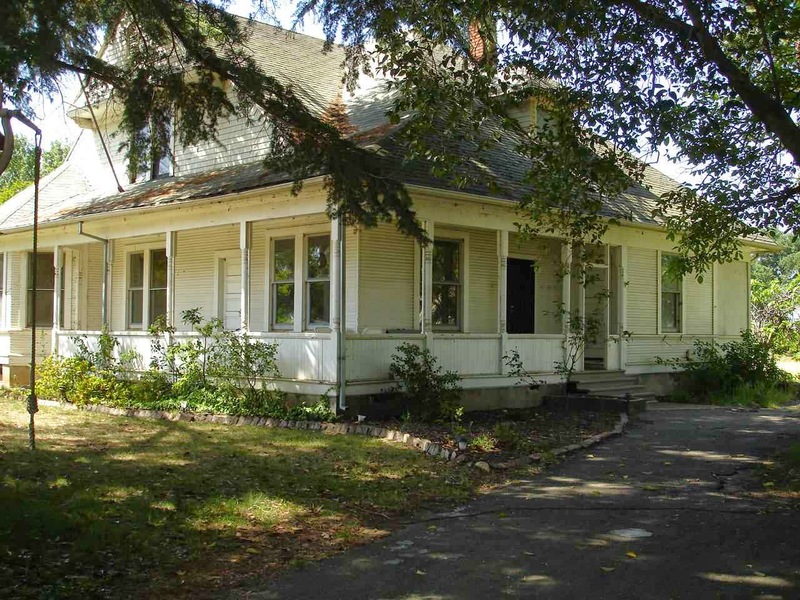 Very pleasant with a wrap around porch. Currently, it is being renovated. No. Just the driveway for Jessie's Grove. We spent some time in Lodi. A pretty and friendly downtown area. Jan and I purchased some wonderful cheese, olive oil, and special vinegar from one shop. We also grabbed a fired pizza from a new shop just opened by another young thirty something. Another nice surprise was the opportunity to visit with Patrice, a friend from back home that many of you will remember. 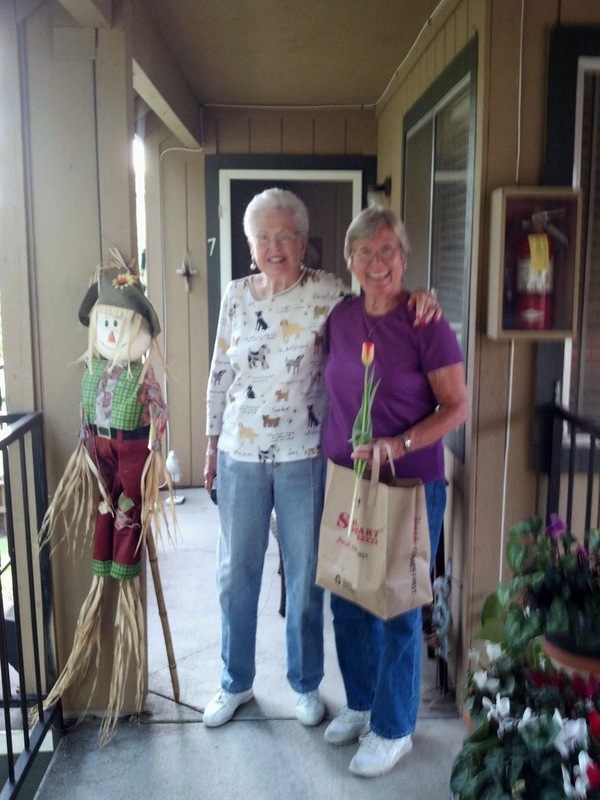 We were happy to see Patrice and her apartment, just a short walk from downtown Lodi. It is not nice to mention age, but Patrice, at the age of 83, is still very active with church, volunteering, and also working! as a member of the Police--uniform and all. Impressive! 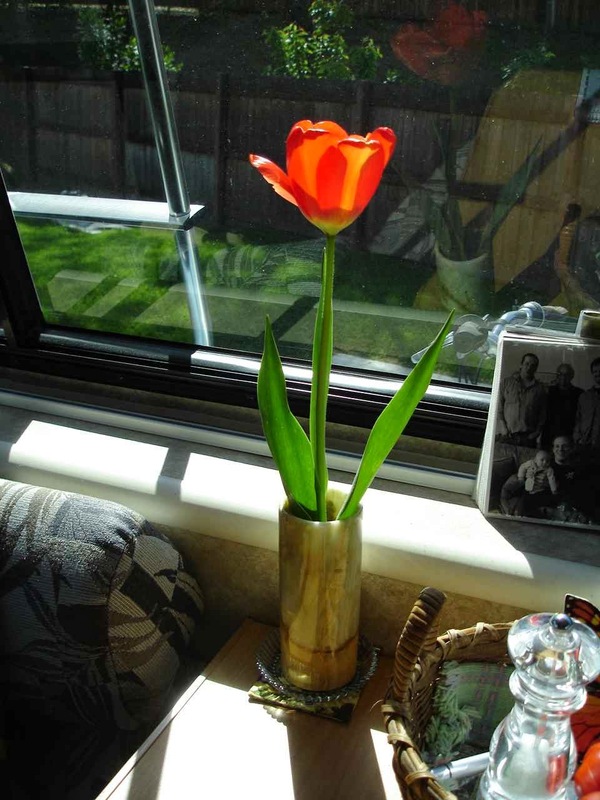 Patrice had a surprise lunch all arranged for us and even gave Jan a wonderful tulip that was happy to spruce up Lady Blue. 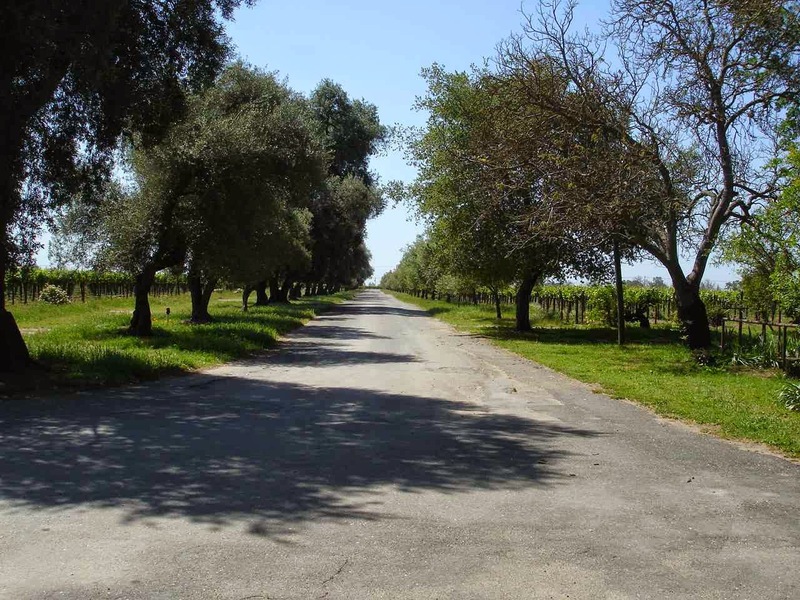 From Lodi, it was a short drive to Napa, California. 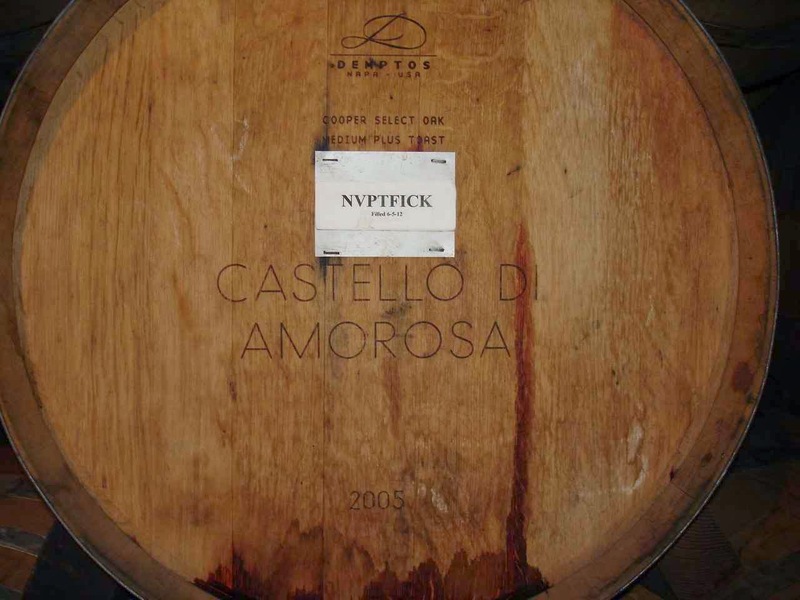 For most people our age, we associate Napa with the emergence of American wine as a contender and winner on the world stage. What a difference from the vineyards in Lodi. 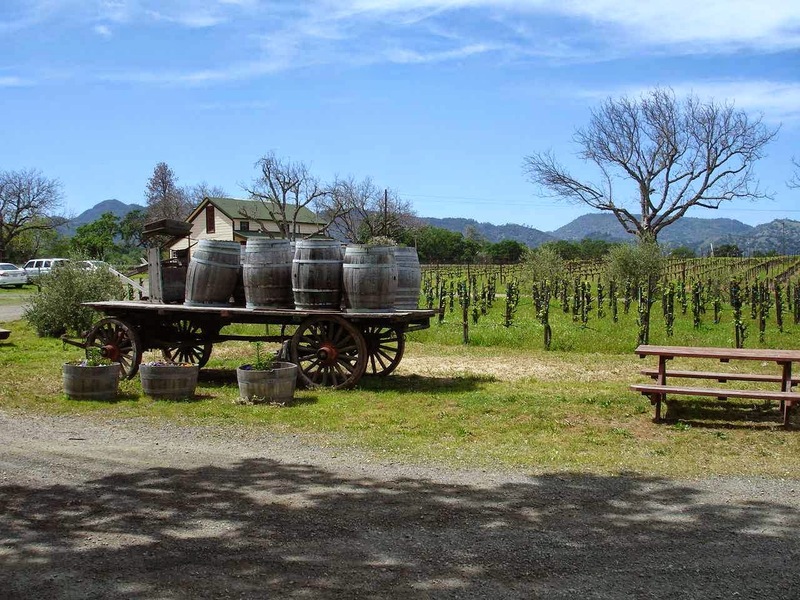 Along Route 29 , north of town, is a parade of beautiful wine tasting properties as well as the vineyards. Parallel to the road travels the Napa Valley Wine Train http://winetrain.com/?utm_campaign=Internet&utm_medium=CPC&utm_source=GoogleAdwords2013-Homepage&utm_content=Google%20Adwords%202013%20-%20Homepage&gclid=COj8uMXE6L0CFQeRfgodrU8A6g We saw the train and were quite impressed at how full it was on a Wednesday. Very popular. Our first stop the next day on route 29, was a winery recommended by a camper we met in our Napa camping spot. 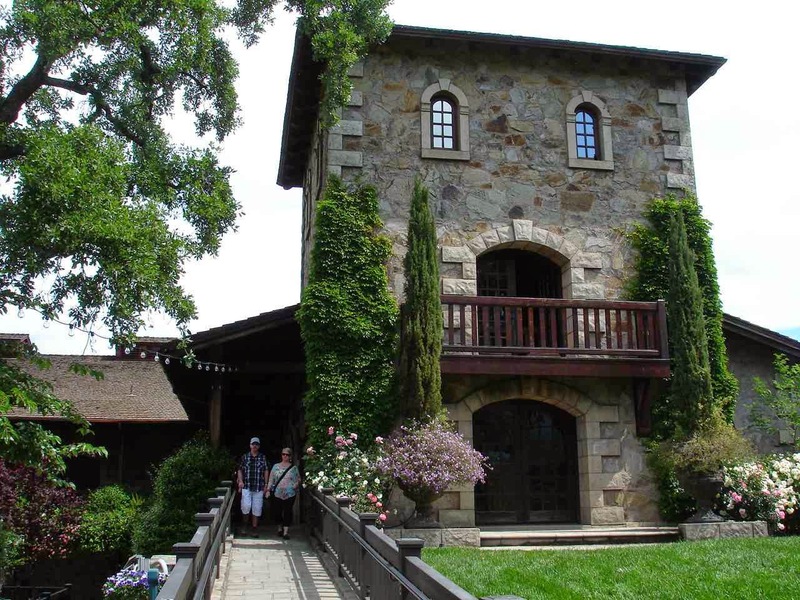 We quickly noted that these elaborate wineries and tasting rooms had no need and no room for Harvest Hosts. They were extremely busy and the traffic was huge and slow. Beautiful grounds and crowds of people. A plus at this winery is a very good deli that allows visitors to purchase makings for a great picnic to go with their wine. All of which can be enjoyed in the shade at tables around the grounds. Had to take this picture for Alison , although we wish the picture color was truer to the actual. A perfect shade of lavender. All winemaking , storage, bottling, and sales are done from this property. I added this link to the picnic grounds, but you can see all the other offerings including weddings. A picture from the wine cellar and caves. A little history in some rooms and a special room for their wine club members for tasting. 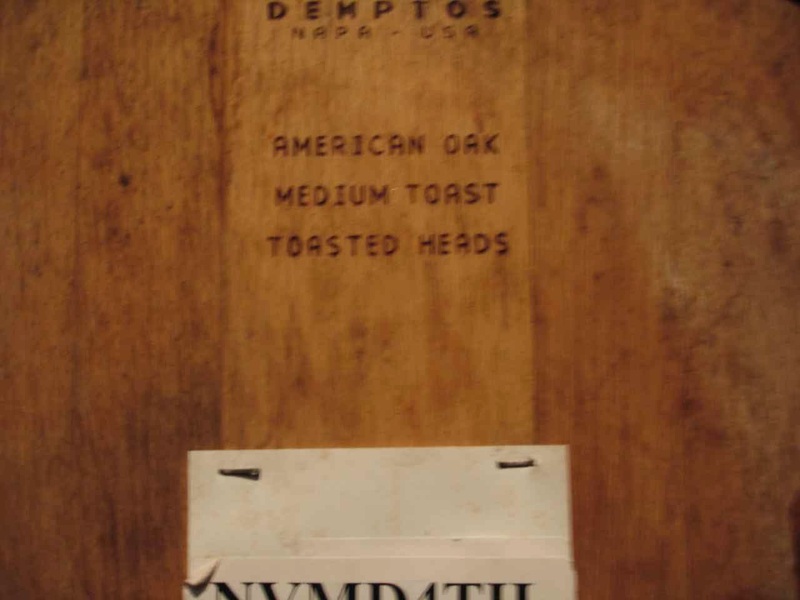 Do you like to read oak wine barrels? All different reasons to pick different barrels. American, French, and Hungarian. 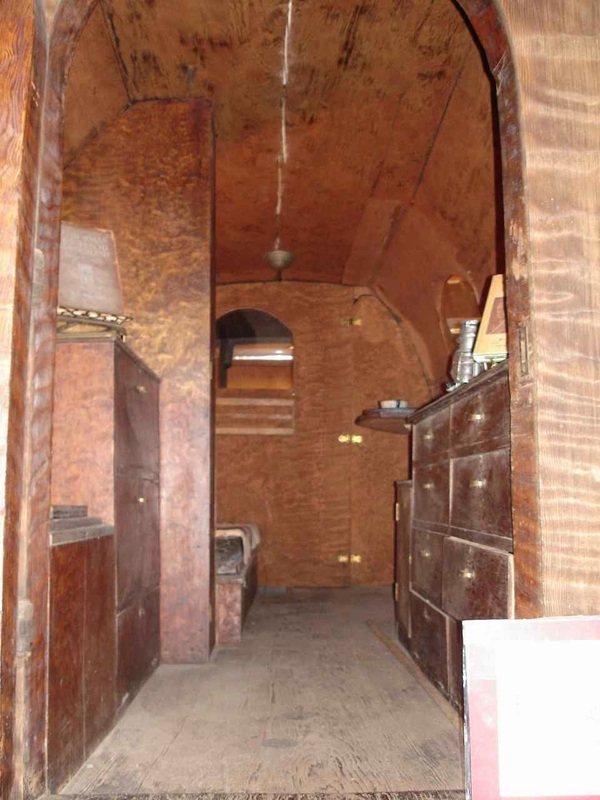 The "toast" refers to the charring of the inside. Dave?, Did you notice "Cooper Select Oak"? Castello Di Amorosa is actually another winery with a very elaborate "castle" as the main feature of the grounds. 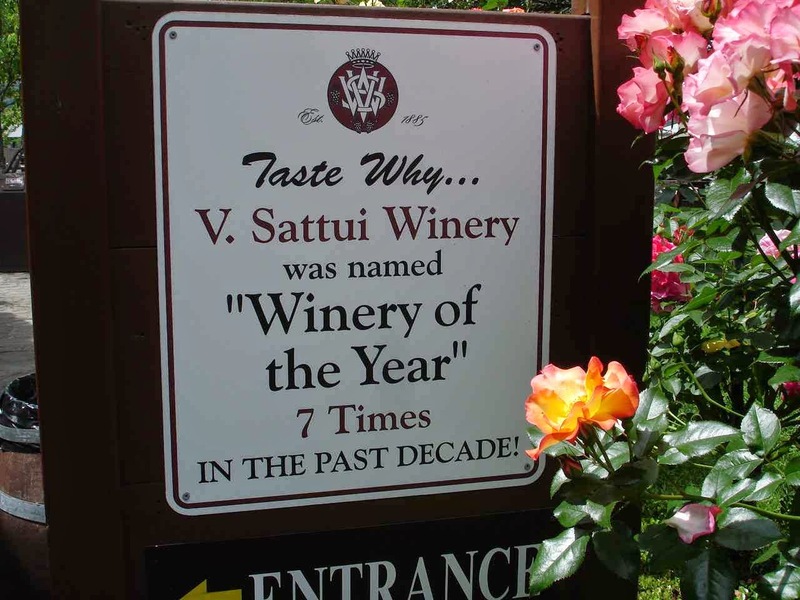 V.Sattui uses grapes and wines from other vineyards as well as their own. A very twisty. steep, and narrow 13 miles takes us off Route 29 to Pope Valley. 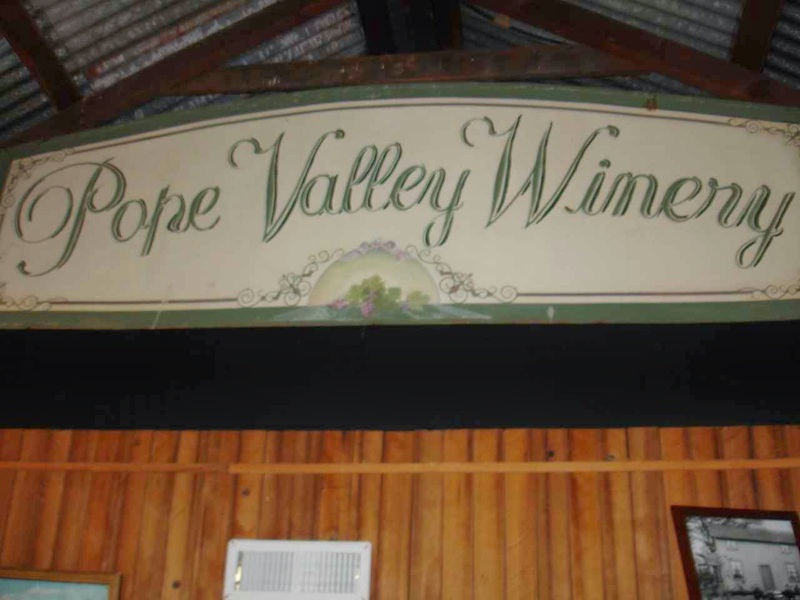 A much more down to earth , old time winery with a familiar family name! 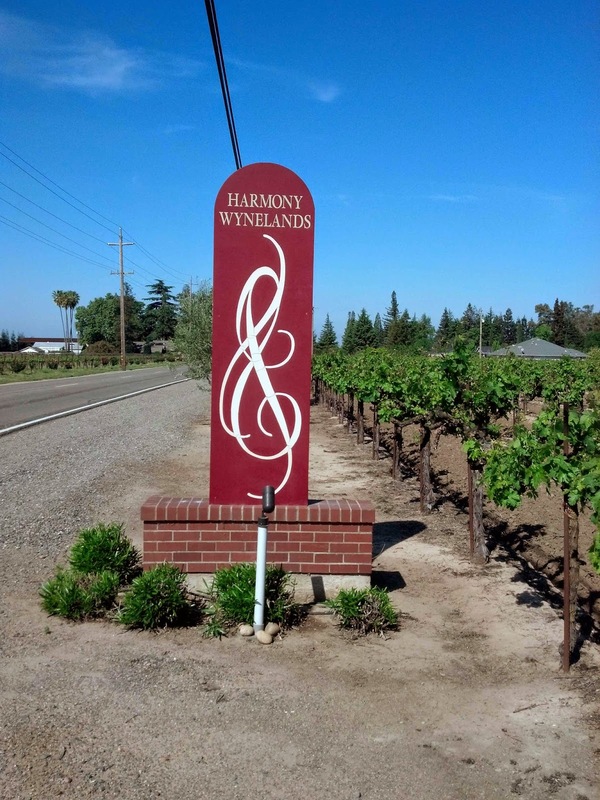 Not only does it have a history back to the 1800's, but a little more connection to the history of winemaking and the survival of some of these wineries during Prohibition. 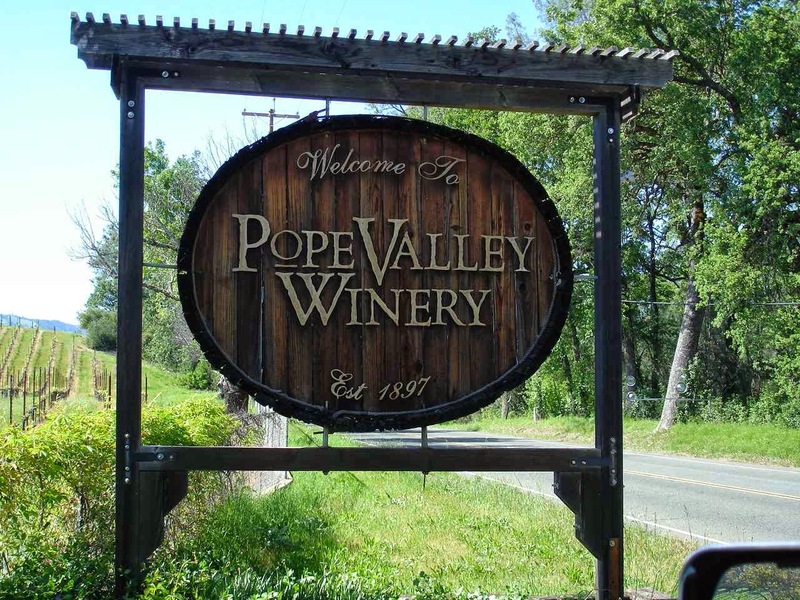 Pope Valley Winery sailed right through Prohibition by shipping wines to Chicago---to someone called Al Capone. The wine was served in Al's speakeasies and brothels. However, when Capone started "offing" people, the winery decided to stop the shipping. In contrast,V. 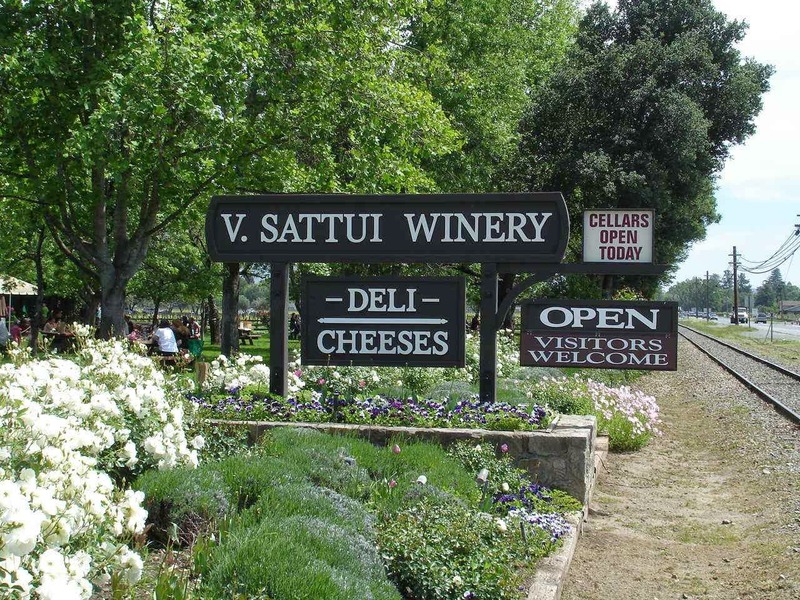 Sattui closed his winery which did not reopen again until the grandson reopened in the 1970's. Ed Haus was the founder in 1897. 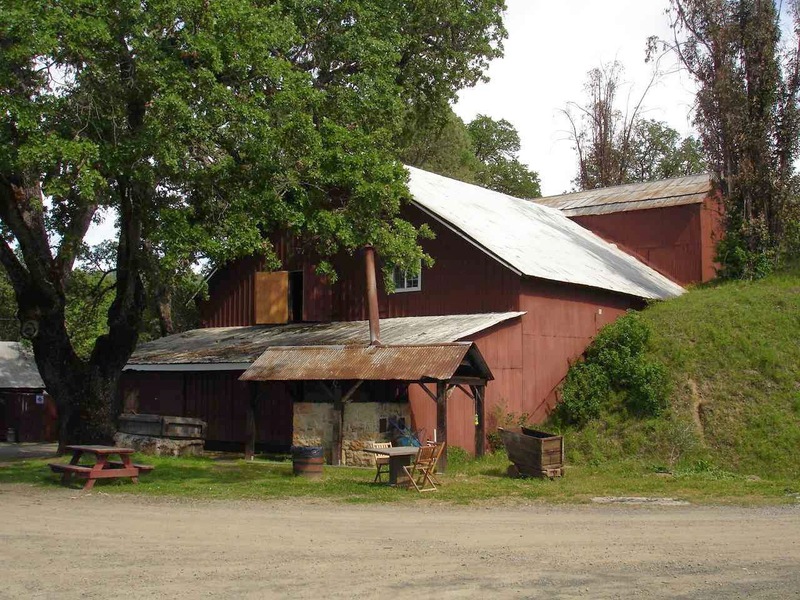 In a showcase of 19th century technology, he built this three story barn into the hillside. 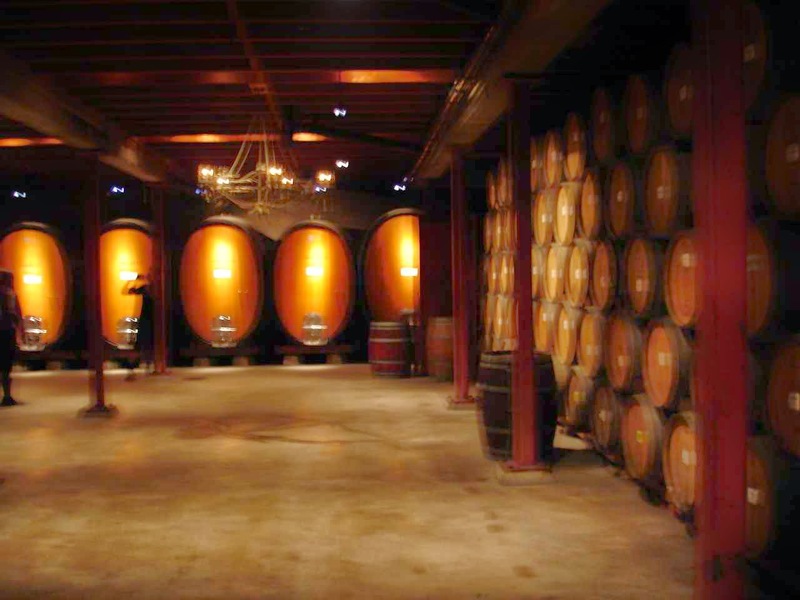 The grapes could be started at the top of the hill and then wound up in the bottom floor in barrels. The room was naturally temperature controlled by the hillside. On site was a creek to help run the blacksmithing shop--tools are still there. The small shed in front that looks like it might be a barbeque, is really the old time hot water heater. Another young winemake, this is Charlie. He says he was born in the 90's. Like we said, young workers. He was explaining to Jan how Ed Haus had hand cut through the shale behind Jan to create this three story building. The current and future wines are aging in the barrels Charlie was great, walked us around the property and gave us a golf cart ride through the vineyards. This is a view from the Tasting Room and the Barn. A beautiful property surrounded by miles of other beautiful property. 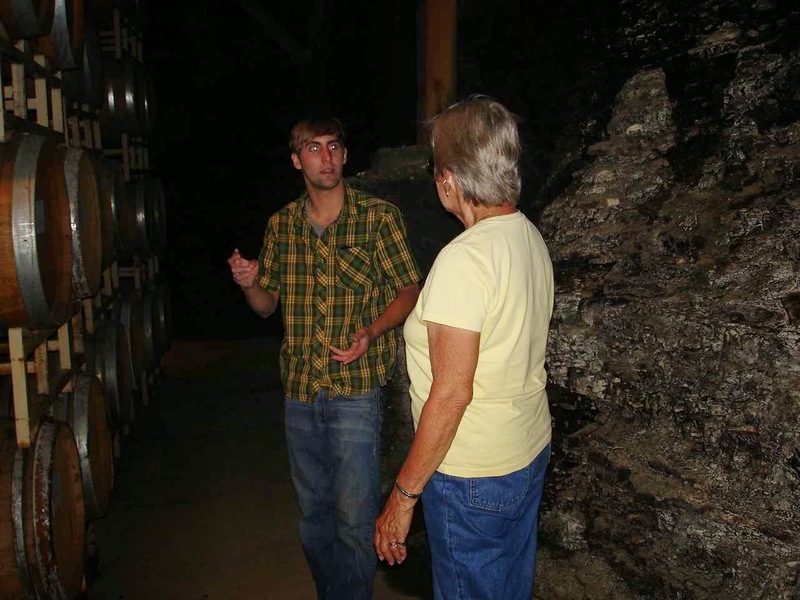 We enjoyed Charlie--currently a local college student majoring in "winemaking"---because he absolutely loved his job. An interesting addendum to our visit. While in the Tasting Room, a gentlemen came in to pick up a few cases of wine. He started talking in a very heavy Italian accent. Very pleasant and pointed out some papers to us. Well, Charlie explained to us that he was the owner of a local Italian Restaurant. The menu looked wonderful. It was like a scene from old wine areas of France. Local produce, local wines, and local restaurants. Everyone connected to each other. We are given the opinion that Californians are proud of their local foods. Such a nice visit along the wine trail. Right now, we are relaxing in Clear Lake State Park. Just sitting and watching the fishermen, birds, and scenery!